NECA is thrilled to present one of our most frequently requested action figures of all time! 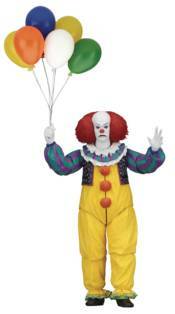 From the revered 1990 horror mini-series Stephen Kings IT, Pennywise the killer clown takes action figure form.Based on Tim Currys portrayal of the terrifying clown, this 7" scale figure is faithful to his on-screen appearance and packed with detail and accessories. Pennywise is fully articulated and features a total of four interchangeable heads, plus alternate monster hands, noisemaker, bunch of balloons and paper boat. Comes in collector-friendly deluxe window box packaging with opening flap.